GameStop is one of several big-name stocks set to post earnings results over the shortened trade week ahead. Stocks rose last week to push the S&P 500 (SNPINDEX:^GSPC) further into record territory. The Dow Jones Industrial Average (DJINDICES:^DJI) remained just below its high-water mark. 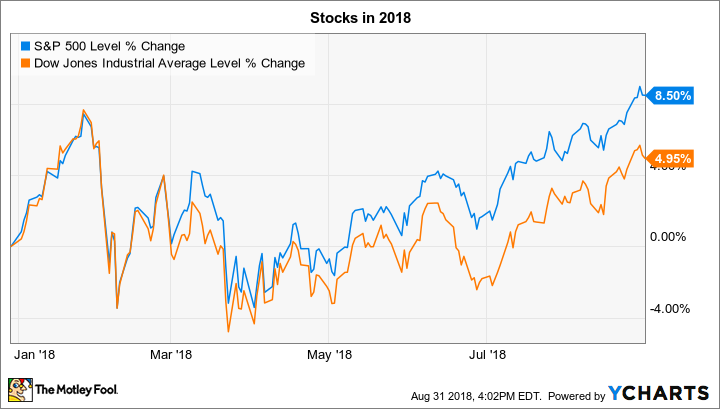 Both indexes are in solidly positive territory so far in 2018. With the Labor Day holiday keeping major exchanges closed on Monday, and with earnings season winding down, the calendar isn't as packed as it has been lately. But investors are still anticipating quarterly reports that could send shares of Five Below (NASDAQ:FIVE), GameStop (NYSE:GME), and Okta (NASDAQ:OKTA) moving in the shortened trading week ahead. Let's take a closer look. Five Below shares have shot up this year as investors gained confidence that the youth-focused retailer has a long runway for growth ahead. Its last quarterly report was highlighted by a 27% spike in sales and rising profitability, and those positive trends support management's hopes to roughly triple the company's sales footprint over the long term. Yet Five Below's latest results contained a few worrying trends -- including falling customer traffic -- that investors will want to watch closely for signs of a rebound this week. CEO Joel Anderson and his team, meanwhile, had predicted a slight drop in profitability over the next few quarters; it will be interesting to see whether that forecast improves, as it has for many other retailers lately. Overall, though, Five Below should at least affirm its fiscal-year forecast, which calls for modest sales gains at existing locations that, combined with over 125 new locations, will push revenue higher by at least 20% this year. Cloud-based security services specialist Okta is set to post its results after the market closes on Thursday. And with the stock up over 100% so far this year, it's fair to say that investors are expecting lots of good news. Okta's last quarterly report was highlighted by a 60% sales spike as the company continued to gain big clients for its security software offerings. Operating cash flow turned positive, as well, but spending priorities ensured that the company still lost money. Net loss amounted to $26 million, or $0.25 per share. Executives predicted back in June that second-quarter sales would come in between $84 million and $85 million, equating to growth of about 40% over the prior year. Net loss should reach roughly $0.21 per share. Hitting these numbers would keep the company on pace for its wider fiscal-year targets for revenue of between $353 million and $357 million and non-GAAP net loss of between $0.58 and $0.54 per share. Investors have a few good reasons to be interested in GameStop's earnings report this week. The specialty retailer is struggling with major challenges right now, both in its core video game business and in new operating lines like its consumer technology brands segment. The gaming category posted sharp sales declines last quarter, thanks to a hangover from Nintendo's Switch console launch in the prior-year period. GameStop's tech brands segment, meanwhile, endured a double-digit revenue slump, and shed profits as customer traffic dipped. Investors are hoping to see signs of improving business trends in the second half of the year as major game releases, including Call of Duty: Black Ops 4 and Red Dead Redemption 2, inject more excitement into the category. Yet shareholders are likely more interested in hearing any updates the company might provide on its potential sale. Executives revealed back in June that they were in "exploratory discussions" on this topic, but haven't yet issued any concrete details about the talks.